From trademark infringements to content theft, these are just a few of the nuisances you have to deal with as your brand grows bigger. 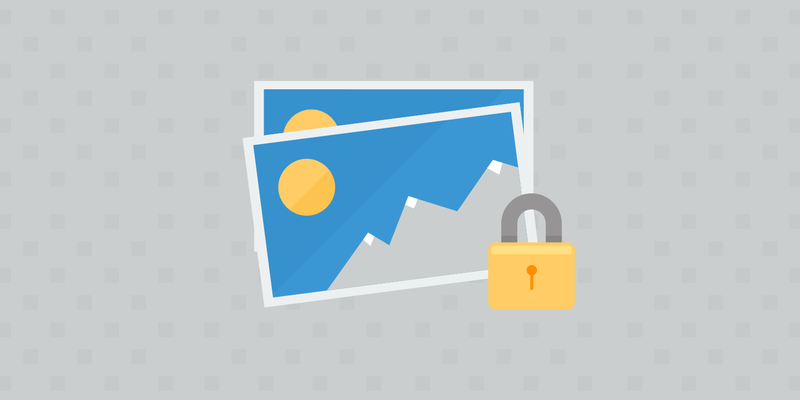 Over the past year, Kinsta has had its content stolen more times than we can count. In fact, filing DMCA takedown requests has unfortunately become a regular ongoing task for us. The bigger you are, the worst it is. However, it’s important to take action by going down the proper legal channels in order to protect your brand image and also ensure potential customers see only what you want them to see. 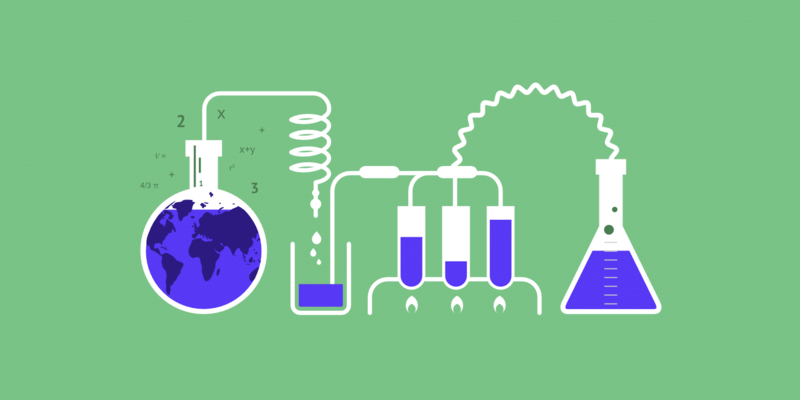 In a way, you could almost look at trademark infringement reports as a form of conversion rate optimization. 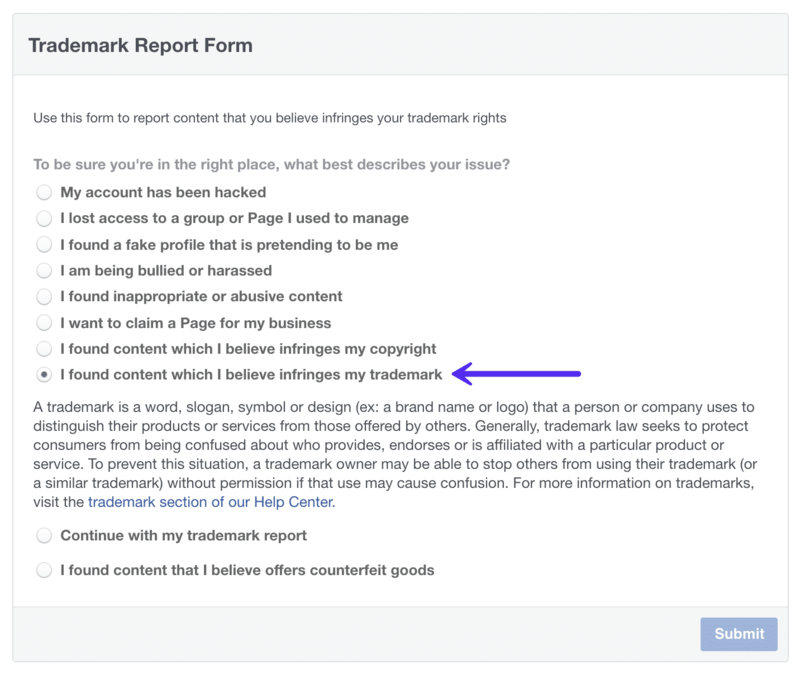 Today we’ll discuss why you should never leave trademark infringed content up and walk you through how to file a Facebook trademark infringement report. While it might not be the most riveting topic, you’ll most likely end up having to do the same for your brand at one point or another. A trademark can be anything that represents your brand, such as a word, business name, phrase, symbol, or even a design (logo). It can be legally registered and protected, as it is used to distinguish your services and or goods from that of another. Unlike patents and copyrights, trademarks don’t expire. Why Do People Infringe on Brand’s Trademarks? As you probably guessed, our “Kinsta” brand name is trademarked. Therefore, others are not allowed to use this. Unfortunately, this isn’t always clear or perhaps individuals just don’t care as they are trying to make a quick buck. Why do people do this? Well, in the example we are going to show you today, a Kinsta affiliate created a Facebook page called “Kinsta Hosting” (as seen below). The purpose was to appear as if they were Kinsta and post regular content updates from our site. The catch is that they would attach their Kinsta affiliate link to everything to try and make a commission. In 99% of these cases, you can safely bet the reason someone is trying to impersonate you is to try and make money. 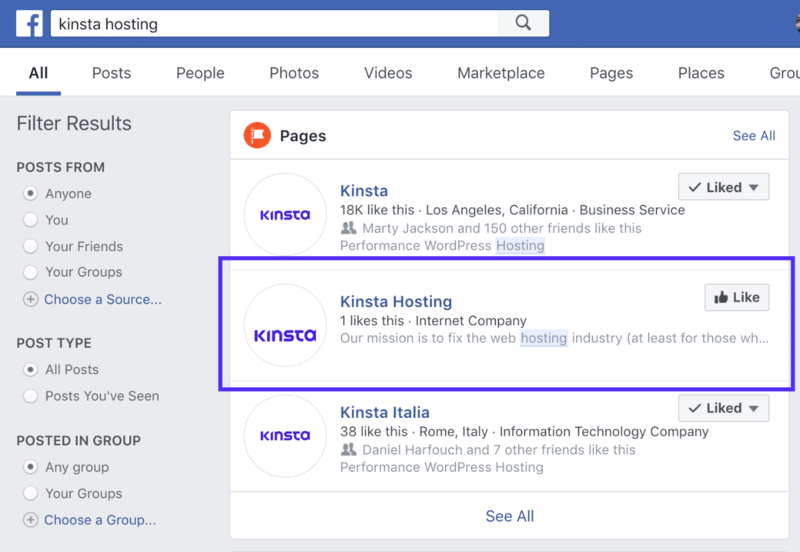 The affiliate is not allowed to use Kinsta.com or Kinsta’s trademarked name in a URL or in online advertising. We gave them two weeks to respond and didn’t receive anything. We could, of course, ban them from our affiliate program. However, simply banning them is not enough as the Facebook page would still be there. Below we’ll share with you why leaving something like this up is a bad idea. 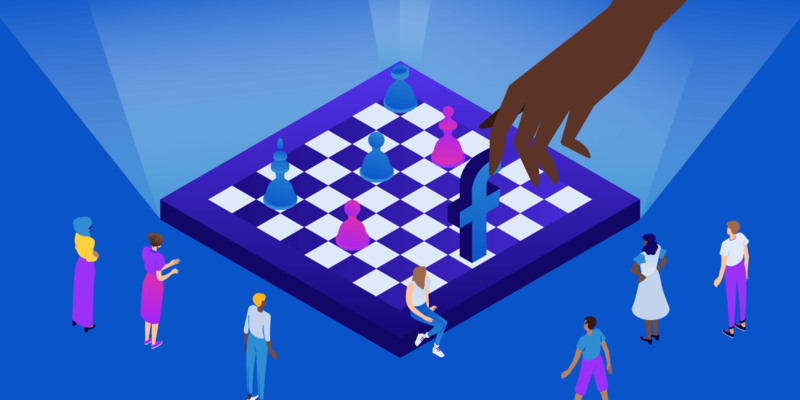 At first, you might not think leaving up a trademark infringed Facebook page is that big of a deal. However, let us show you the four main reasons why it matters. The same goes for all social networks, not just Facebook. As you can see below, the Facebook page created by the individual shows up in search results. 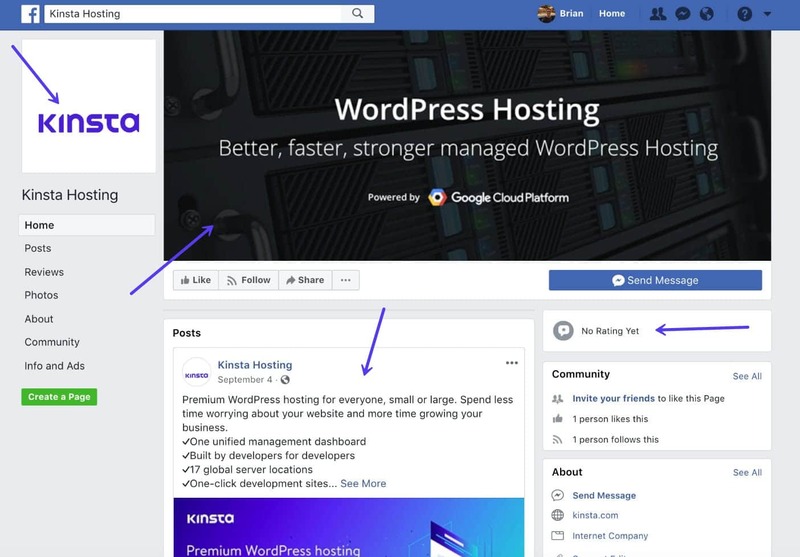 In our case, if people searched for “Kinsta” or “Kinsta hosting” the individual’s page would show up, sometimes above or below ours. 😠 This is horrible! If someone is searching specifically for our company, we by no means want a potential customer landing on another page that isn’t controlled by us. Facebook pages are indexed in Google. This again kind of deals with search results. If someone searches in Google for your Facebook page, you don’t want someone else coming up. The other side to this is that it also uses the trademark name in the Facebook page URL. You should, by all means, protect your trademark as much as possible when it comes to URLs. Tagging is a function used by a lot of different social media networks, including Facebook. Basically how it works is that if someone wants you to see something they are sharing, they will tag your company by using the @ symbol and your brand name. 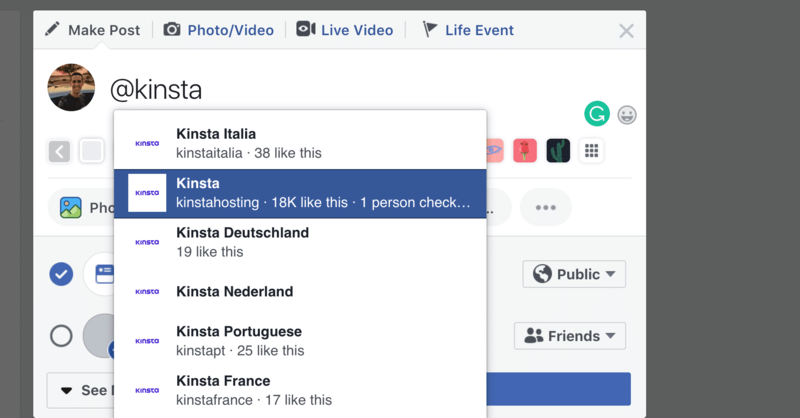 If someone has created additional Facebook pages impersonating your brand, people might tag the wrong one and you’ll completely miss these mentions. Sometimes people also will tag you when they have a question. The last thing you want is them tagging someone else and you are never able to respond. Something as simple as this could lose you a customer. They uploaded a logo that isn’t positioned or sized correctly. They used a Facebook page banner with branding that was over two years old. Their page has no ratings. This immediately gives the impression that our company isn’t very big or hasn’t received any positive reviews from customers. The content the individual was sharing was not current and not in the format we typically use on Facebook. 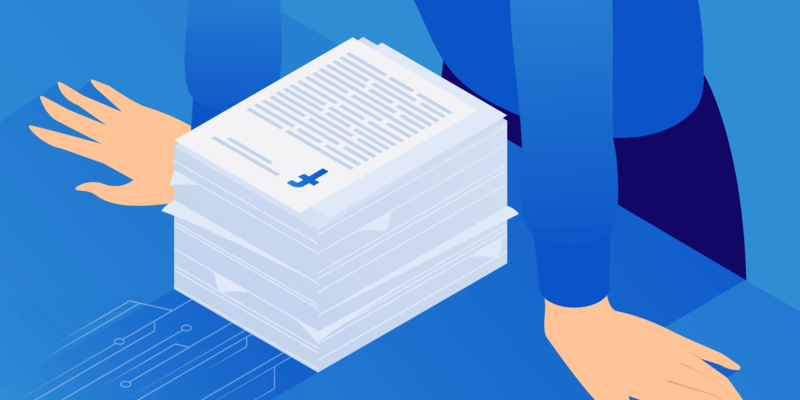 Now that you’ve heard a few of reasons why you should make sure to get these pages taken down, let’s look at exactly how to do that. 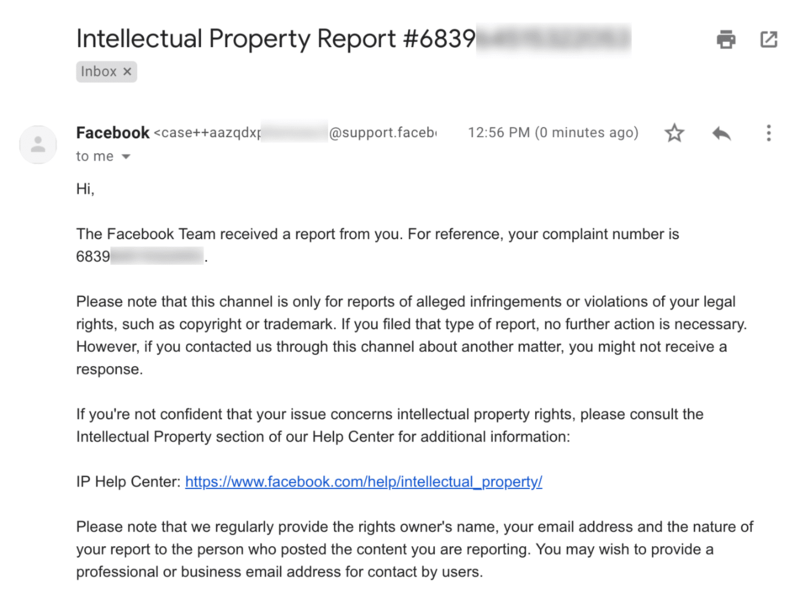 Facebook takes trademark infringement very seriously and out of all the reports we’ve filed, they have always removed the offending content and or pages within 24 hours. Impressive to say the least. 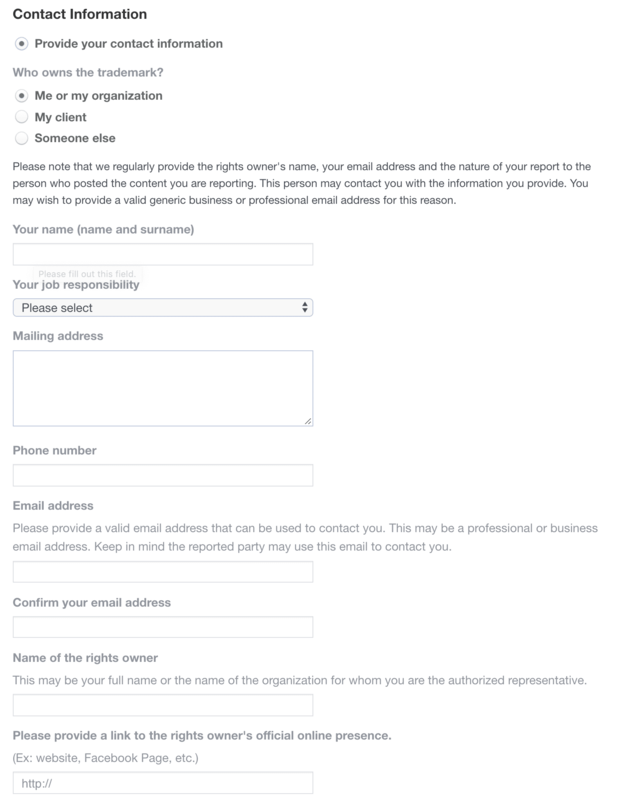 As you can see above, the form can also be used for copyright complaints and other issues. The second step is to fill out your company’s contact information. The next step is to provide your trademark information. 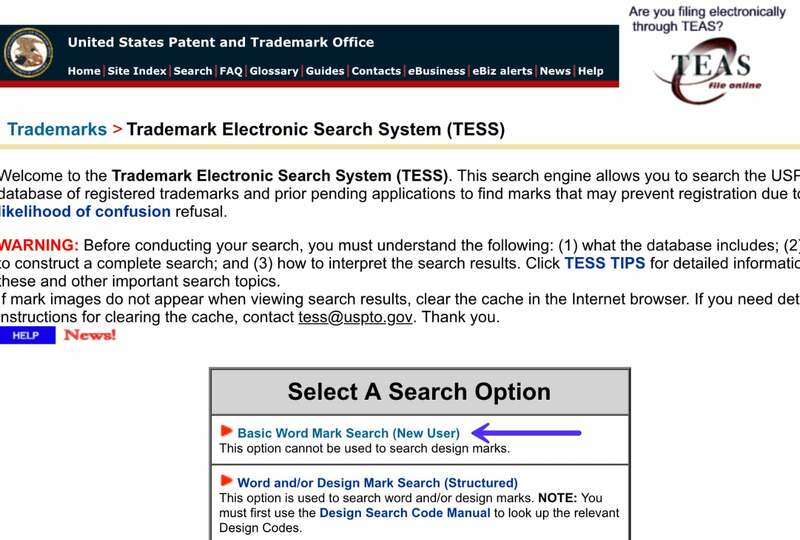 See below on how to find your trademark information. 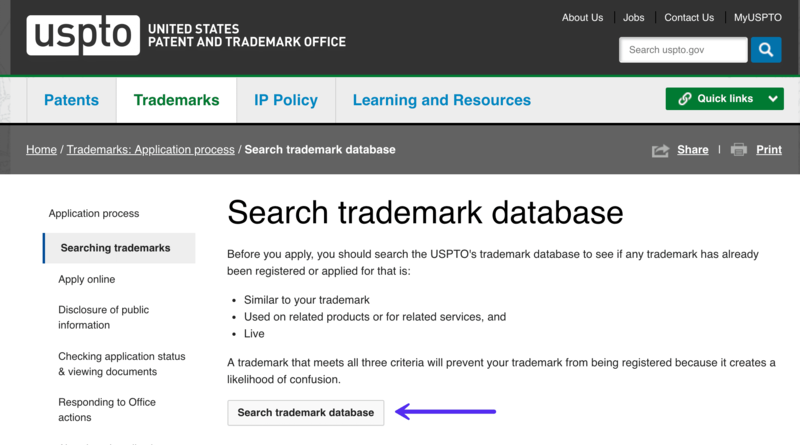 There are a couple of places to find your trademark information. This will vary based on where your trademark and company is registered. 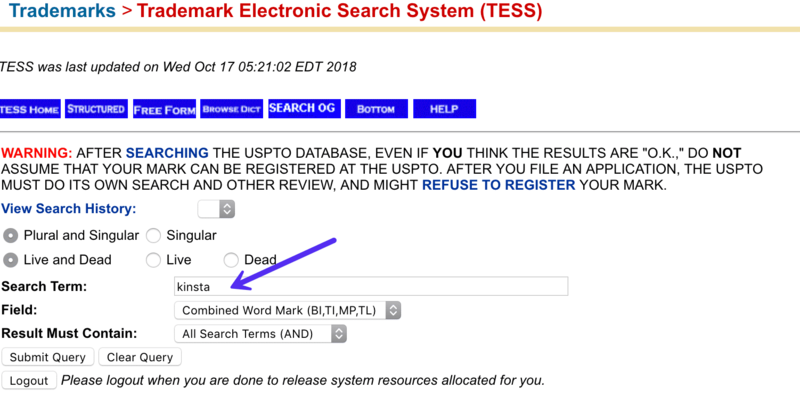 If your trademark is registered in the United States, it will most likely be in the USPTO’s trademark database. In the UK, you can use GOV.UK. You can also check the WIPO Global Brand Database. Otherwise, you can do a quick Google search for your own country’s respective trademark database. Click on “Basic Word Mark Search (New User)” for the search option. Then enter in your company’s brand name as a search term. It will then return existing trademarks. 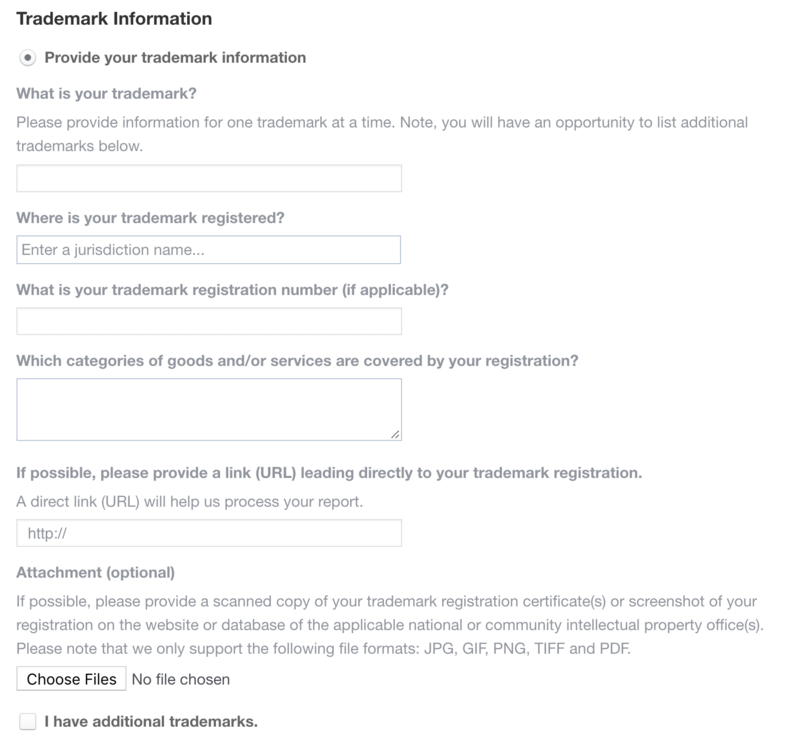 On the trademark page, you’ll find a trademark registration number which you’ll need to complete the Facebook form. They also give you the option to attach a PDF or PNG of the trademark page. We recommend doing this as we’ve found a few of the online trademark databases don’t work properly in terms of linking directly down to a search result. On the final step, Facebook will ask you the location of the content you want to report. In this case, it is “An entire Page, group or profile.” Simply copy and paste the URL of the page. After hitting the submit button you’ll receive an email from Facebook with the report # and confirmation that they will look into your case. We have filed multiple trademark infringement reports and Facebook has always responded within 24 hours and removed the offending pages. Compared to other networks with similar trademark infringement reporting, Facebook is honestly one of the fastest! What happens to the content when it is taken down? It will no longer be accessible and will show the following message: “Sorry, this content isn’t available right now.” Once you see this, it has been removed from Facebook search results and is no longer taggable. A few days later it will drop out of Google’s index. Our advice is that you shouldn’t ignore trademark infringements. They tarnish your brand and confuse potential customers. 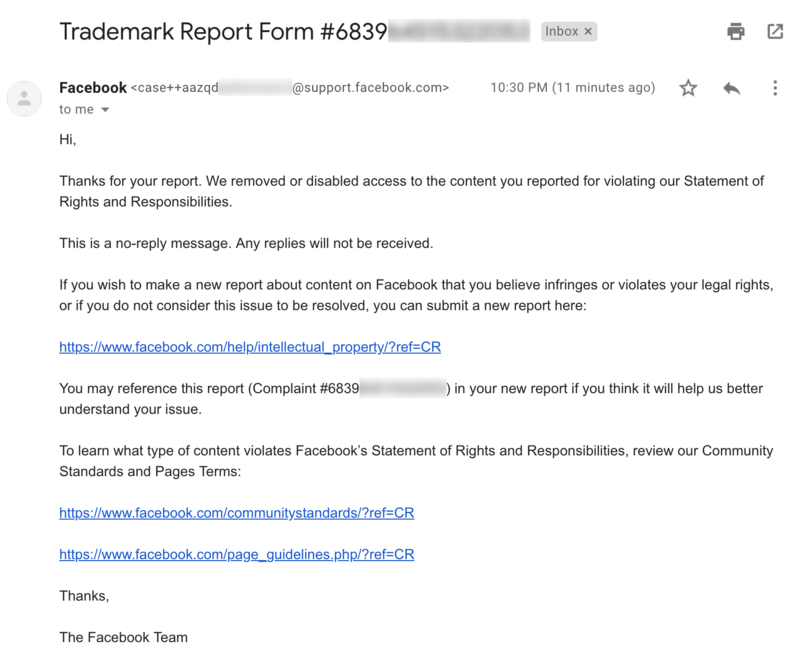 Thankfully, Facebook makes reporting trademark infringements super easy! Just a few simple steps and you can have the offending content and or pages taken down in no time. Have you dealt with Facebook trademark infringements or individuals impersonating your brand? We would love to hear your thoughts on this topic below in the comments.